I think I've caught whatever Hillary has. No, I'm not pregnant. I'm talking about her doll quilt decorating idea. I've already told Hillary I may have to copy her. Now that Little isn't so little and has lost her tiny dog-filled room, I've been looking for a clever way to decorate her new space. Little toddler bed, big empty wall above it: what could be better than to cover it with small quilts! 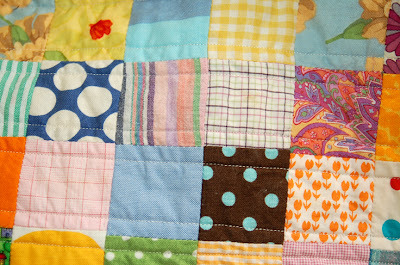 But this quilt isn't meant to hang on the wall; it's exclusively for use with dolls, dogs, and a cat or two. 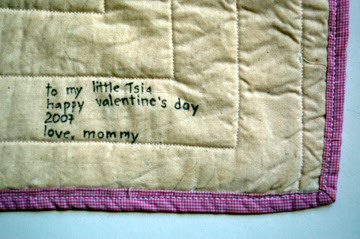 A little valentine for my little valentine. She calls herself "Tsia" (pronounced tSEE-ah) now. Which isn't her name, but I like it and use it frequently myself. We dug into the scrap bin for this quilt. Any piece that was large enough (2" square) was used, with no discrimination whatsoever regarding pattern, color, etc.. I was a little worried about the results with such a willy-nilly selection, but I think it's ok. And true to the quick, simple nature of doll quilts as per the Alex Anderson podcast, I didn't worry too much about matching corners and such. In the end, it was lots of fun and quick to make. I like the way it looks when the sun shines through, too. I'm catching that bug, too and I have two boys who probably won't be thrilled to have a wall of their room covered in doll quilts. I love the shot of the sun shining through yours--it reminds me of pojaji. Oh, I think it's lovely. I'm coming down with it, too! I haven't acted on it, yet, except to buy two vintage books on doll- and crib-quilts and post pics from them on my flickr photostream. Once I wrap up some more of my unfinished projects, I'll probably come down with a full-blown case of dollquilt-itis! That is absolutely cute. I like using lots of fabric and a nice plain border. I think the willy-nilly fabric selection looks great -- I love the, hm, tendencies that are revealed when people work from stash/scraps! 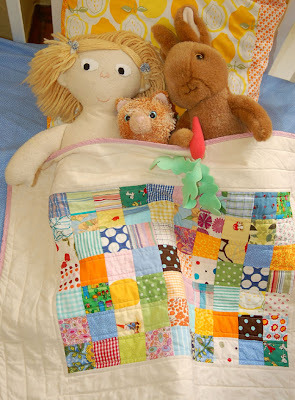 I'm planning on doing a doll bedding ensemble for my little girl's birthday, so I'm loving all of the tiny quilt talk going around. oh my, that is just scrumptous! I wish my first attempt at a little doll quilt looked that nice! it is fabulous! I love the combination of prints. I wouldn't mind making one myself for my little one. It looks as if it would be a great introduction to quilting. Can you give me a heads up on the overall dimensions...So I can do the maths on the borders. That is a gorgeous photo with the sun shining through the quilt. Isn't it funny what kids call themselves? Mine is convinced his name is "the baby." Musn't forget the "the" either! 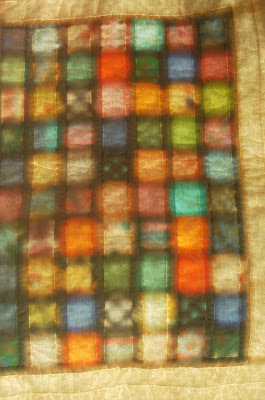 The quilt is beautiful - and the shot with the light coming through is AMAZING, it looks like wax paper. Oh my goodness, that is beautiful! What a sweet gift; I'm sure your little one loves it. I am in awe of that gorgeous photograph with the sunlight coming through the patchwork. I love the simple design and how the border makes the middle look so vivid and colourful. Very fresh. I think I caught that whatever it is, too.